One of the things I've been up to the last few weeks is testing a new Bluetooth TNC made by Rob WX9O who is selling them as Mobilinkd. I had to put testing on hold while my Motorola smartphone went away to be repaired (by BuzzBox whom I can recommend highly.) In the meantime word got round and Rob sold out of these gadgets before I could write about it. The price was around $49.95 which I thought at the time was amazingly cheap and probably explains why they are all sold out at the time of writing. The module is a small PCB slightly smaller than a Baofeng UV-3R and if you remove the belt clip it can easily be fixed to the back of it. My picture shows it strapped to the back of one of the Baofeng's predecessors, where it makes a nice inexpensive and compact APRS tracker. 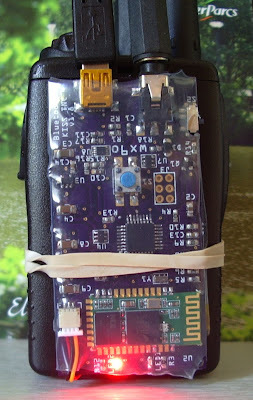 The board and it's battery (which can be charged using a USB cable as shown in the photo) are shrink-wrapped in a tough translucent plastic casing. Ready-made cables are available. Rob sent me a Kenwood-format two-pin connector which fits the later model Baofengs and the two worked together perfectly. The audio levels were just right on both transmit and receive. Yes, receive. This is no mere tracker. It's a full KISS TNC and decoded all the packets received by the Baofeng. 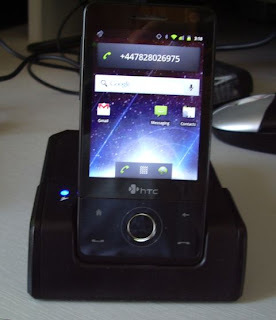 The software used was the latest APRSDroid running on my Motorola Milestone (a.k.a. Droid) smartphone. Droid and TNC paired easily and made an effective APRS mobile station. I did try to pair up the TNC with APRSISCE on an HTC Touch Pro running Windows Mobile 6.1. The two devices paired but could not connect as the Bluetooth software did not recognize the TNC as a valid device type. I think that is a limitation of the Windows Mobile Bluetooth software rather than the TNC module. If you are interested in APRS and would prefer to do it over the radio rather than a cellular data connection (real hams use RF, right?) then this is a nice toy to play with. They say that to err is human, to really foul things up you need a computer. And I have been fouling a lot of things up recently. The latest thing that I fouled up is the G4ILO's Shack visitors book. On the site I also have a contact log. This runs from a backup of my KComm (MixW format) log file. KComm automatically backs up my log to the web server, in order to create an off-site backup of my log. As a bonus, I have a PHP script that reads this backup file and displays the contents in a human-readable format. What I stupidly did, when re-configuring KComm after my computer troubles a couple of weeks ago, was put the guest book file name log.dat for the backup file name, instead of what it should have been: g4ilo.log. So when KComm uploaded my contact log backup it overwrote the guest book data file instead. I only discovered this after wondering why the contact log on the site wasn't updating. I looked back in the site backups maintained by the hosting service but they only go back a couple of weeks. I must have made the error before then. All I have managed to salvage is the most recent 3 entries. I'm rather upset about that, because the guest book contained comments made over many years from the early days of the site, which I had painstakingly preserved over various versions of guest book script. At least I didn't lose my contact log going back to 2001. That would have been a disaster! There was a good opening on 6m this morning which lasted until early afternoon. I'd just been reading some list traffic on how good the KX3 receiver is so I thought I would plug it in to the antenna and see what I could do. After all, Six is the magic band, who needs 100 watts? Listening on the two receivers was like night and day. On the KX3 the band sounded much more lively. Stations that were only peaking an S7 on the K3 were S9 plus. On the KX3 with just 10 watts, just because a station was loud it didn't mean I could work them. I got some 59 reports but with several stations they didn't hear me even if I had no competition. The loudest stations had a lot of callers and they just didn't hear me over the crowd. You wouldn't think 9dB would make all that much difference but it does! I've seen comments about the K3 being deaf on 6m, or even 10m, but I had never really bothered about it until now. If I can hear them on the K3 I can usually work them even though I generally limit the power to 80 watts. But I ended up a bit dissatisfied with the K3's receive performance on one of my favourite bands. The simple solution - fit a preamp between RX IN and RX OUT - isn't an option for me as I need those ports to plumb in the MFJ noise cancelling device. It's a pity no-one has come up with a mod to boost the K3's fairly useless internal preamp on 50MHz. Kit Hall GM4EMX has sent details about a new unattended APRS iGate that will be located at his QTH in Aberdeen. The callsign will be MB7UAB. Kit told me something I didn't know about the allocation of callsigns for APRS stations in the UK. Two letters following the U denote an iGate. I hope Kit's new iGate will soon spark some activity in the Aberdeen area which up until now has been pretty much an APRS desert. I never did find out what was causing Google Chrome to crash so much on my computer. However, after several months of using Chrome I found Firefox rather slow and clunky. So I had a look round to see if there were any other browsers. It turned out that there were more alternatives than I ever imagined. The first alternative browser I found was one called Avant. This is a powerful browser with a lot of configurability, developed by a Chinese programmer. It boasts the ability to render web pages using your choice of the Internet Explorer, Firefox or Chrome rendering engines, which is probably handy if you're a website developer. I set it to use Chrome and it displayed the pages that had give me trouble with nary a murmur. But I found the user interface rather heavy after the minimalist approach of Google Chrome. So I kept it on my hard drive but carried on looking. The next candidate I stumbled across was SRWare Iron. It almost counts as two browsers in one, as it installed two shortcuts on my desktop, one named SRWare Iron and one named Chromium, both pointing to the same executable. This turns out to be a browser built from the same open source code as Google's Chrome by a German company. Germans seem to be a bit sensitive about privacy, so the main difference with this SRWare browser is that it does not send information about your browsing habits back to Google. What, you didn't know Google Chrome did that? Neither did I until I discovered this program, though I thought I opted out of this during Chrome's installation. Apparently you can opt out of all the Google tracking if you choose the appropriate settings in Chrome, but most users won't do this. So Iron / Chromium could be said to be a better version of Chrome than Google's, certainly from the privacy point of view. Chrome extensions like AdBlock Plus work as with the real thing. 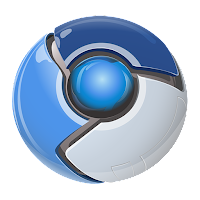 Chromium even supports the ability to log in to your Google account to save and restore your bookmarks and other settings, which was very handy. Try it, you'll never notice the difference. I'm happy with Chromium / Iron as my default web browser now. So far, it hasn't crashed on me. But I also discovered another Chrome clone. It's called Comodo Dragon and it's made by the Comodo security company. Dragon is also built from the Chrome open source code and omits the Google tracking code, but it has some extra security features added by Comodo. So it looks like an even better option if you are really privacy-conscious. I've not been doing much radio the last couple of weeks. I haven't been able to raise much enthusiasm. No doubt for those of you with jobs, being able to play radio all day would be a blissful situation. But it's not much fun being in this small, sweaty shack in this hot, sunny weather. I'd really like to be able to get out and about in the beautiful Lakeland countryside, further than I can reach on my own two feet. And my hopes of doing that took a bit of a blow yesterday. I did continue trying to get Google Chrome to run on my shack computer. For a short time I thought I had succeeded. I spotted that Microsoft .Net 3.5 was installed twice. I uninstalled both copies and Chrome appeared to be stable after that. Then I spotted Windows Update installing Net 3.5 again, and before I could stop it Chrome immediately crashed. I tried removing Net 3.5 again after disabling automatic updates, but this time it didn't help. I could crash Chrome every single time I opened this post from PD0AC's blog. Usually Chrome would just vanish from the screen, but other times I got blue-screen or black-screen error messages and once Windows XP spontaneously rebooted. So I have given up. Goodbye Chrome. It was fun while it lasted. But in the last day or so Google Chrome has become so crash-prone that it is unusable. Suggested solutions amounted to disabling plugins and add-ons but my installation was pretty basic apart from AdBlock. Nevertheless I took the step of uninstalling Chrome completely and then reinstalling again. But it still crashes. Just trying to sign in to Yahoo is enough to crash it. So it's back to Firefox. I don't have time for flaky browsers. I'm still getting the repercussions from the lapse in attention which resulted in LinkedIn sending invitations to anyone who has ever emailed me. Most people have just deleted or ignored them. A few were concerned that the email might have been a virus and contacted me to ask if I really had sent it. But now LinkedIn is emailing everyone who didn't reply with a message saying I'm still waiting for them to accept the invitation. A few people have been annoyed by these emails and have asked me to stop sending them. Unfortunately the deed was done a few weeks ago and I have no idea how to put a stop to it. If I had known that it was going to cause this much hassle I wouldn't have even considered accepting someone's invitation but hindsight is a wonderful thing that I unfortunately don't possess and now there is no undoing it. Last week when I posted about using the new dual-mode version of WSJT-X I mentioned a utility I had used to put my Elecraft K3 into split mode before starting WSJT-X and returning it to normal operation after finishing. I've been asked to share information about it, so here you are. The utility is called KRun, from K-Run. 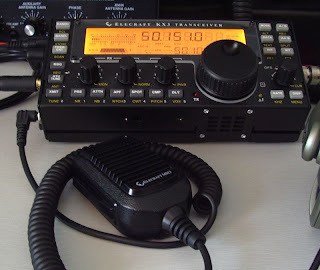 K for Elecraft radios (K2, K3 etc.) and Run because you use it to run another program. It was written to use with my Elecraft transceivers but I see no reason why it should not work with other radios that use a similar CAT command syntax such as Kenwoods. Don't ask me if it can be used with your Yaesu or Icom radios because I know nothing at all about their command format. 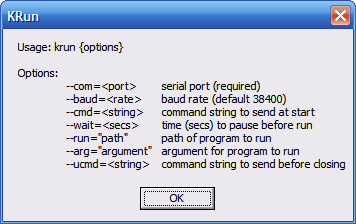 If you run the utility it puts up a window listing its command line parameters. These command line parameters are what tells KRun what you want it to do, so you'll need to know how to create a shortcut containing command line parameters, or use a batch file. You'll also need to know what CAT commands to use, which will require a degree of familiarity with the Programmer's Reference manual for your radio. To create a shortcut to do this, first create a shortcut to KRun itself, then edit the Target to add the command line parameters as given above. 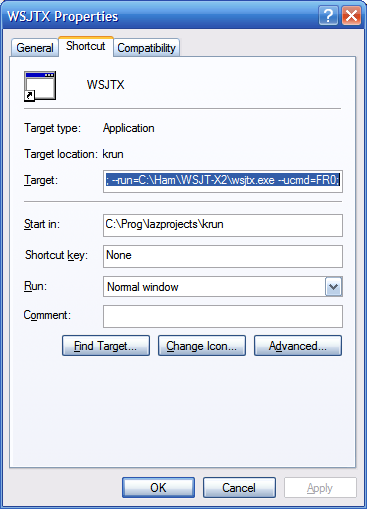 You can download KRun as a zip file which contains KRun.exe, the utility itself, and WSJTX, a shortcut configured as described above. If you try to use the provided shortcut instead of creating one from scratch yourself you will need to change the program paths to suit your own system. So there you are. It works for me so hopefully it will work for you. If it doesn't then a better solution would be to persuade K1JT to add these CAT commands to WSJT-X! My Motorola Droid has been sent away for repair (requiring a part from China, a two week wait and a cost of over £50.) As I am therefore without a phone, I thought that I would try to install XDAndroid on my old HTC Touch Pro. I tried it once before about 3 years ago and it worked well enough to convince me that Android was a better phone operating system than Windows Mobile 6.1, but not well enough to be usable as an everyday phone. This time I hoped that there would have been some updates to make Android more stable. The installation process seemed easier than I remembered. I thought I would document it, not just for others but for my own benefit in case I want to repeat the procedure for a third time. You will need a blank microSD card. 4GB is plenty big enough. Then download the XDAndroid package from the repository at http://htcandroid.xland.cz/. I chose GBX0C_Full_Bundle_2012.04.24.zip because it was the newest. Unzip the package to a temporary folder. The result is a folder named after the bundle,containing the files. Copy all the files (but not the folder itself) to the root directory of the microSD card. The next step is to identify your model of phone. There is a long string of letters and numbers under the battery near the serial number stickers in tiny print. It will be 4 letters and a number. Mine said RAPH100: Raphael is the code name for the Touch Pro. Having determined the code name, look in the files you unzipped for a folder named Startups. It contains several folders with names to match the phone. In the RAPH folder was another folder named RAPH100. That folder contains a file named startup.txt. Copy this to the root directory of the microSD card along with the other files. Now you can put the microSD card in the phone, replace the battery and switch it on. Watch the boot process carefully. It should stop at one point and ask you to perform the screen calibration. When I did this before, I recall that the the script displayed boxes on the screen that I had to tap with the stylus. This time there were no boxes displayed, so I had to guess the positions. The first time I guessed wrong: the result was an installation of Android that was insensitive to my touches. I tried again after watching a YouTube video of the process which showed the screen calibration and saw that the tap points were: top left, top right, screen centre, bottom left and bottom right. After you have tapped the five points the boot process then carries on for several more minutes after which you should see an Android opening screen. Swipe the lock to the right and away you go! In Windows Mobile you can create a shortcut to the program Haret.exe in your Start Menu which will make it easier to start Android next time. Do be certain that you create a shortcut not a copy because Haret has to be run from the root of the microSD card. This version of XDAndroid seems a bit more stable than the one I installed three years ago. It's good enough for an emergency phone, which this is, but it runs slowly and functions like Bluetooth and GPS don't work reliably. Development of this Android port ceased a year or so ago so there won't be any updates. Interest in running Android on HTC Windows Mobile devices ebbed away as the users got themselves real Android phones. But it will do for now. It whiled away an afternoon and resulted in something I can use until my Droid returns from repair. At the end of last month I was testing a new version of WSJT-X for Joe, K1JT, under NDA. The program has now been released, so I can write about it. The major new feature is that WSJT-X 1.1 supports both JT65 and JT9. What is even more remarkable about it is that it can decode both modes at the same time! Enabling dual modes is optional, but if you use the feature and double-click on a station to reply to it the program will switch to the correct mode for the reply. Another thing about this new version is that it can decode signals in a bandwidth 4kHz wide. If you have a transceiver that can receive such a wide bandwidth - Flex SDR radios can do this, as can the Kenwood TS2000 and my Elecraft K3 with FM filter installed - then you can take advantage of this capability. I didn't think my K3 could go that wide, but all that was needed was to run the K3 Utility and enable the FM filter in DATA mode. If you're sharp then you will have thought of a snag. What happens if you reply to a station on the right hand side of the bandwidth? Receiving may be OK through the FM filter but on transmit the 2.7KHz SSB filter is used. The solution is clever: you keep the audio in the range 1 to 2kHz, engage SPLIT mode and set the transmit frequency to shift the signal up or down so that it matches the frequency of the station you are working. I must admit that this perplexed me at first as I didn't understand the significance of operating in split mode. My audio tones (heard with the K3 monitor turned up a little) were often lower or higher than the station I was replying to, and I was afraid I was replying on the wrong frequency. In fact, I was: I had forgotten to switch SPLIT on! To avoid mistakes in future I created a Windows shortcut using a little utility I wrote to send a CAT SPLIT ON command before starting WSJT-X 1.1 and equally importantly, set SPLIT OFF when I had finished a session with WSJT-X. It's just too much to expect me to remember to do this manually! I suggested to Joe that WSJT-X itself should send the split commands, but apparently it's not that simple when you have to cater for every transceiver under the sun. So if you are working JT9 or JT65 and stations reply to you one or two kHz off-frequency don't be surprised. I should make it clear: WSJT-X 1.1 doesn't decode both modes across 4kHz. It decodes JT65 in the lower half and JT9 in the upper half. You get to decide where the dividing line lies. 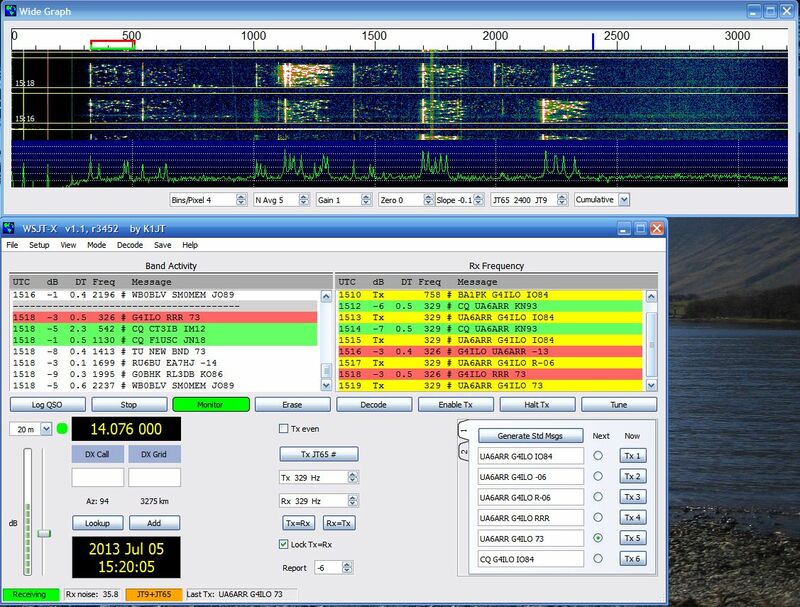 Joe K1JT thinks that JT9 users will move down a bit into the top end of the JT65 range, to enable people whose transceivers don't give them 4kHz bandwidth to take advantage o9f the ability to work dual modes. In fact, at the moment, the result seems to be to have enabled JT65 users to spread out over 3kHz or more as is clearly illustrated by my screenshot. Time will tell. I'm still reconstructing my PC system after the disk got trashed. I didn't lose any important files nor my ham radio stuff. But many of the configuration settings that Microsoft helpfully squirrels away in hidden locations like the registry or somewhere off Documents and Settings were not backed up. Mea culpa. Unfortunately I never came across a full backup system that I liked (I purchased Acronis but it was full of bugs that they want you to pay for an upgrade to sort out. I keep on discovering things that need to be restored. I was getting some gobbledygook decodes from WSJT-X and then remembered that I needed to install Meinberg NTP. But the installation failed: the service wouldn't start, reporting the error that "NTP failed to respond in a timely manner." There is a note on the Meinberg website that the service might fail unless you install some Visual Studio restributable package, so I installed it but still no luck. I've run Meinberg NTP for years and have recommended it to everyone and it's so annoying that I can't install it. Hacking the registry to up the frequency of Windows Time updates. Nothing for it but to rely on good old Windows Time Service. I found the registry hack that lets you increase the frequency of updates. 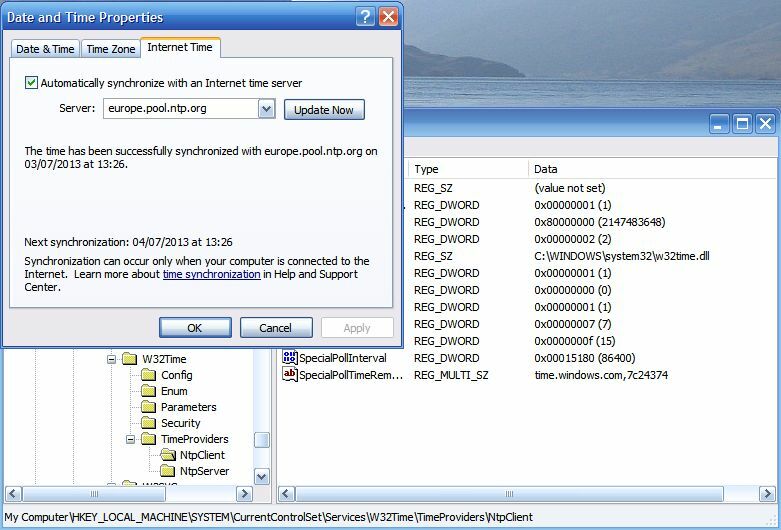 I also changed the time server to europe.pool.ntp.org which responded much more quickly that time.windows.com. Hopefully that will do the trick. I hunted for an old version of Meinberg from before 2009 which I must have installed when I first set the PC up, but no luck.